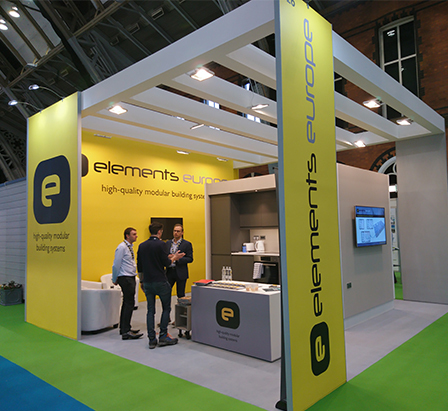 Elements Europe has exhibited and spoken at this year’s CIH Show in Manchester. The Show brings together a diverse audience of sector professionals and partners over three days to celebrate excellence, share ideas, best practice and innovative solutions to the residential sector. Special guest speakers and insightful interviews from housing experts and influential business leaders made for an excellent show. Representatives from Elements Europe presented its Co-pod modular unit at the show. Designed specifically for the residential sector, the Co-pod was met with huge interest from delegates. “The Co-pod is a unique self-contained unit that has all the essential services required for modular housing with the ability to be organised in different configurations to suit a range of housing needs.” Commented Kevin Arthur, Director at Elements Europe. The units provide kitchen, bath, shower, staircase, storage, power, lighting, ventilation, heating, heat recovery and communications within a single offsite manufacturing system. All mains building services can be located in a central core and since each unit contains all of the required service elements there is no need for first or second fix mechanical and electrical services with the building. As well as exhibiting, Elements Europe was invited to speak within one of the main seminar slots. Simon Underwood, Director at Elements Europe took to the stage during the second day to speak to a packed seminar theatre about how modular is impacting the construction industry.